I was feeling rather feral when I walked through my front door, like a precious housecat who had been locked out for 5 days and comes home dirty, fur matted, covered in scratches and smelling of urine. A bath, the first order of business – but I am rather proud of my filthy appearance and wish to show it off. Alas, Kevin is not home – no audience for bragging, so I retire to a hot tub to review the weekend. I met up with Alison at midnight in front of the Bredbo Inn and we camped in front of a cemetery at the end of a road leading to the river. You’d think it would be a quiet location, but there was a considerable amount of action down that road into the wee hours, such is life in small town Australia. The next morning, we (and when I say we, I mean, Alison) strapped my gear to the RumPig and splashed through the river and over the mountains on the other side. The road was rough enough to make the destination feel isolated, but the scenery was gorgeous and rugged – except for the part where we had to stop and chat with some local colour. Seems Jr. got a new rifle for his birthday and he wanted to shoot a fox, or a roo, or a deer, or a pig, or a wild dog, or a rabbit, (all of which inhabit the area). Not a wombat? Personally, I think they should spend their money on orthodontia, not ammunition. 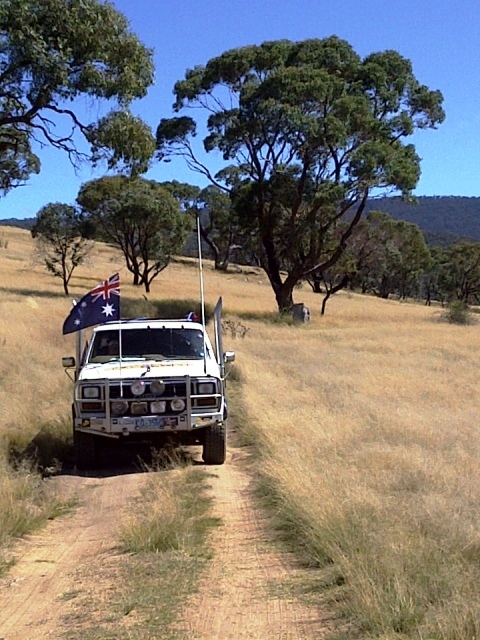 · Defended the campsite from a kangaroo by chasing it through the paddock on a quad bike. · Defended the campsite from rogue beer cans by shooting them with lead pellets. · Defended the campsite from wasps by building a trap from a Coke bottle and a plastic bag. · Defended the campsite from pirates by performing a shoreline survey in kayaks. · Defended the campsite from the ground by repeatedly shooting arrows into it. · Defended the campsite from Yabbies by making sure they stayed in the river and not in my net. · Defended the campsite from stray branches by incinerating them in a 55 gallon stove. The drive home took a total of 24 hours, with some dawdling and some sleeping. As a rule, Australians do not drive at night, and for good reason. It is a problem that does not get much attention in the public forum, and one which clearly plagues the nation. I have decided that it is time for me to take action. I am going to initiate an awareness campaign to help shed light on the debilitating effects of marsupial depression. Each night, thousands of depressed marsupials march to the edge of the highway, hopeless, dejected, and fling themselves into traffic in a desperate bid for relief from their sufferings. Please visit my website, www.beyond-roo.org and help support the mental health of Australian Outback Wildlife.